Faith #10 Review – AiPT! 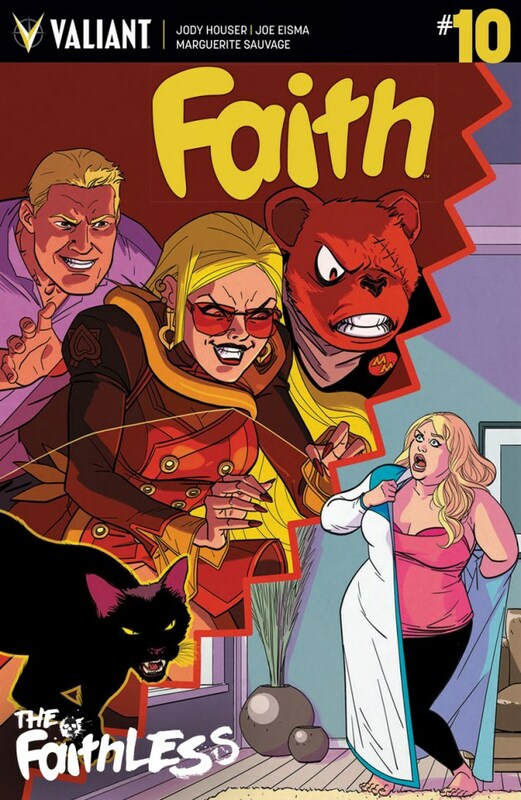 In the start of a new arc, Faith is facing her first ever villain team-up! Is it good? Faith is having a really good day; she’s saved a civilian, played a good game of D&D, and hung out with folks who know both her identities. But little does she know that while she’s relaxing, her four major rogues are ganging up against her! The hitch that Faith got over the past couple issues is absolutely continuing. The team has truly found the perfect balance between heart, humor, and action, and just in time for a new story arc. I love the villain team. Houser has done a fantastic job of making each one truly individual and the way they interact with each other is classic. I think this is going to be a really fun story arc. At first, I wasn’t sure if I liked Joe Eisma’s art. The way he plays with shading mixed with the sketchy quality of the lines is very different, especially against Marguerite Sauvage’s sequences, but it ended up growing on me as the issue went along. He does a fantastic job with his facial expressions and his colors really pop. This is a comic that keeps getting better and I’m definitely looking forward to seeing where this arc goes. The team has truly found the perfect balance between heart, humor, and action.